Important documents required for GCET counselling process. Aadhar Card for date of birth proof. Family income certificate or tuition fee waiver. Transfer certificate and migration certificate. 10th and 12th mark sheets and passing certificates. Directorate of Technical Education will be starting counselling process of GCET 2019 from 17th May, 2019 that is 2 days after the GCET 2019 result. And the GCET 2019 will commence on 17th June 2019. Form A: For admission to Engineering & Pharmacy Courses. Form B: For admission to NEET based professional degree courses in MBBS/ BDS/ AHS/ BHMS/ BAMS/ Nursing. Form C: For admission to Architecture [B.Arch] degree course based on NATA. Step 1: Candidates have to fill the above-mentioned admission application form based on the course opted. Step 2: Completed forms have to be submitted in person at the Directorate of Technical Education, Porvorim. Step 3: After submission, the candidate will be issued an acknowledgement card which has to be produced at the time of counselling. Step 4: There will be three rounds of GOA CET Counselling, but an additional round may be held in case there are vacant seats left. Step 5: Only those candidates who are listed on the merit list of GCET will be allowed to participate in GCET 2019 counselling. Step 1: Candidates has to get the counselling admission form for which course has been opted for and has to fill that admission form. To fill the Counselling Form, the candidate had to enter details like name, GCET registration number, the category under which admission is sought, gender, marks obtained in GCET 2019. The GOA CET/ GCET 2019 counselling form had to be duly filled in the candidate’s own handwriting. After ensuring that all the details were filled correctly, the candidate has to submit the GCET counselling form 2019 in person to the Directorate of Technical Education, Porvorim, Goa and other notified locations. The candidate was handed an acknowledgment card, as proof of receipt of the counselling form. The card must be kept safe, as it has to be displayed at the time of counselling and DTE will not provide any duplicate acknowledgment card. Candidates who are listed in the merit list of GCET 2019 are eligible for counselling. Such candidates have to appear in person for counselling at scheduled location on the scheduled date and time. Each round of GCET 2019 counselling will be conducted in multiple days in which candidates are grouped into various categories based on their merit rank. The allotment of seats will be based on the merit rank of the candidate, order of seat preference, and availability of seats in colleges. 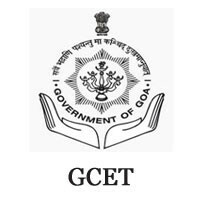 Seat allotment of GCET will include mandatory document verification; only those who successfully complete the document (certificate) verification will be considered for seat allotment. After each round of GCET seat allotment, the list of provisionally allotted candidates will be posted on the official website. Information like institution, branch, category, and marks of such candidates will be displayed. Note: Vacant and unclaimed seat will be moved to the general category and offered in subsequent rounds of counselling. Goa Medical College, Bambolim Goa 403 202. Shree Rayeshwar Institute of Engg. and Info Tech. Shiv-Shail Karai Shiroda Goa 403103. Assagao, Bardez, Goa 403 507. Post Box no. 73, Farmagudi Ponda Goa 403 401. “Shiv-Shail”, Karai Shiroda-Goa 403 103. Rajiv Gandhi Medical Complex, Bambolim Goa 403 202. Agnel Technical Education Complex Verna, Goa 403 722. 18th June Road, Panaji Goa 403 001. Dr T.B.Cunha Educational Complex, Altinho, Panaji Goa 403 001. Near Binani Glass Fibre Pvt. Ltd., Mushir Wado, Colvale, Bardez- Goa 403 513.